Those of you who receive Divagations may have noticed the first hint about a major literary event. As we all know, Mrs. Laura Morland wrote about Madame Koska and her dressmaking establishment, where mysteries, crimes, anonymous letters, beautiful mannequins, and breathtaking fashions are so common, it’s all in a day’s work. We meet Madame Koska in 1933, in High Rising, but the first book was written in 1921 and most likely published in 1922. Until now no copy was found, but last year a copy was discovered in an attic in Peoria, Illinois. A considerable part of the pages were eaten by several generations of mice, so some research and writing was needed to fill in the gaps. The Angela Thirkell Society of North America approached me for the job, which of course I was happy to do, who wouldn’t? Publication is planned for late summer or early spring, and the book will be given as a gift as part of the membership. So please stay tuned to elegant women of mystery, attractive gentlemen who are not what they seem, Russian nobility, shady Eurasian connections, incredible fashions of the 1920s, priceless jewelry, mayhem, burglary, death, history, and romance! Angela Thirkell, the well-loved author who had returned to Anthony’s Trollope’s chronicles of Barset, wrote more than thirty lighthearted, charming novels that still have a loyal fan base. These fans have been reading and rereading her work and have created two societies, one in England, the other in America, always hoping and sighing for new stories about their beloved city of Barchester and its fascinating denizens. For forty years, their wishes did not materialize, but in 2007, the Angela Thirkell Society of North America asked me to write the first sequel to Thirkell’s thirty-odd Barset books, since I was both a devoted member and an author. After a certain amount of arguing and demurring, I accepted the challenge and sat down to write the book. The result, Miss Glamora Tudor!, was distributed as a limited edition that was given to members of the American society as a membership gift, and was not available to readers outside the Society. However, it found its way to England and even to Australia, and despite being a non-commercial, literary society book, was even widely reviewed. Many readers clamored for additional Barchester books. Seeing these responses, I naturally decided to write the second book, Their Exits and Their Entrances. But to distribute it without everyone knowing what happened in Miss Glamora Tudor! did not make sense, so I bundled the two books into The New Chronicles of Barset, and had them published together as one book.The title is based, of course, on Anthony Trollope’s The Last Chronicles of Barset. To assure authenticity of style, the writing was based on my extensive study of the entire body of work of the Barsetshire series. Time-line and the personal history of each character had to be carefully followed. The history of daily life during this period, including aviation, cinema, recreation, literature, and fashion, were carefully researched as well. Most importantly, Thirkell’s distinct approach to language had to be continued, using her three distinct forms: English of the upper classes, English of the lower classes, and American English. I must admit that when embarking on this daunting enterprise, I was a little worried that the purists would fiercely object to my audacity in daring to follow Trollope and Thirkell into Barsetshire. Instead, everyone was very kind and extremely supportive. I would like to thank, in proper alphabetical order, the people who made this book possible: Ms. Kathleen Fish, Ms. Barbara Houlton, and Ms. Louanne Wheeler. Without them, I would have never dared to venture into the Barsetshire Universe. 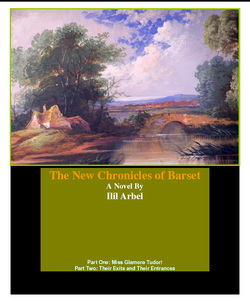 "A recent triumph has been the publication of a full-length novel by Ilil Arbel, entitled The New Chronicles of Barset, which carries the Barsetshire stories forward in the tale of the career of Glamora Tudor, a fictional film-star beloved of Mrs. Thirkell fictional film-goers." "As a fan of Angela Thirkell, I've read and re-read her books for years, and despaired of ever having a new book to read, as Jane Austen has others writing in her style. Well, my wait is over! Miss Glamora Tudor brings a classic Thirkell character who always appears off stage to center stage, and she just runs away with the most wonderful story. It's a bit of backstage Hollywood, a bit of a twist (thriller would be too strong a word) and characters so finely drawn you literary know them after just a few paragraphs. My criteria for a character in a book is: would I have them at a dinner party. This book's characters would all be welcome at a wonderful weekend at a country house!" "Fans of Trollope and Thirkell should be delighted to find that Barsetshire has acquired another chapter in its long, often frivolous and enchanting history. Here is a verbal soufflé to tickle the palate, light and delicious. The scenes will be familiar to any lover of Thirkell, for they are interposed in the latter part of that author's work and one can quite believe that Mrs. Thirkell had these scenes tucked away behind the bookshelf and now they have been brought out for our delectation." INTRODUCTION TO PART ONE: MISS GLAMORA TUDOR! Ladies and gentlemen, may we present: Miss Glamora Tudor! While a lady should never adhere too strictly to dates, one fact must be clarified. The events in Miss Glamora Tudor!occur in 1954. The story begins in August, a year and two months after the June coronation of Queen Elizabeth the Second, who (or should we say whom?) we greatly admire for an unusual reason. During the later part of WWII, Her Majesty (then a lovely young princess) not only trained as a second lieutenant in the women’s services, but she actually drove and repaired trucks! That shows the British spirit at its best, as I am sure everyone would agree, and truly brings tears to our eyes. But enough of these divagations, and let us go back to the explanation of the dates. As it occurs in 1954, the book is not strictly a chronological sequel, but rather a leap in time into a period we preferred. In these days of “prequels” (their word, not ours! ), this is perfectly normal. Besides, it might allow us further ventures into the delightful Barsetshire Universe at various time points. Each Thirkell book describes events that have happened a year before publication. The 1955 book is Enter Sir Robert, and it involves people who have nothing to do with the cast of characters in this book. Since life continues to enroll in Barsetshire even when it’s off stage, who is to say that the events in this book did not take place simultaneously with the events described in Enter Sir Robert, namely, in 1954? Should our calculations seem wrong to any of our readers, please forgive us. It is easy to make a mistake or two in the pleasant atmosphere of the “Cloud Cuckoo Land,” as Angela Thirkell herself described her novels. And is it really all that important? Paraphrasing the words of the immortal Alice, shouldn’t we all sometimes believe in six improbable things before breakfast, or at least before tea? Throughout the novels, Glamora Tudor is always off stage. We only hear about her latest film and her new handsome co-star. Yet we have always sensed a delightful and interesting personality just waiting to emerge into the Barsetshire scene. So why is she never there in person? We think that the omission may have two reasons. First, it could have been a simple oversight. Second, Glamora does not live in Barsetshire, so she can’t show up. The solution to either possibility is to find a good reason for Miss Tudor to visit Barsetshire! Let her march boldly in wearing the glamorous New Look, since she must have ordered her clothes in Paris, let her be British, even though we do not agree that she was based on Anna Neagle, and let her bring some interesting friends of which we have never heard before. So here she is in Glorious Technicolor, and as Miss Jessica Dean would say, let the games begin! Send Me No Lilies is completed, and the whole party is flying in style to Hollywood! They plan to create a huge musical extravaganza based (very sketchily) on Aubrey Clover’s urbane and witty comedy, Dance We Shall. The play is entirely unfit for such a production, but who cares? Such is the power of Hollywood, as long as the censors do not object. A new and exciting star is rising on the horizon, Glamora Tudor is ditching the glamorous life as well as her high heels, and is headed in a completely new and admirable direction. Mr. Alcott is being put under the guidance of the most awe-inspiring (and strangely familiar) English butler of immense wisdom, but that does not prevent him from making a fool of himself… and most surprising, Mrs. Rivers is swept off her respected feet by the love of a younger man, so much like one of her own novels that she feels that at last, at last, life is imitating art. Will she stay with him in glittering Hollywood, or will she do as all her heroines always did, and go back, so pure and chaste, to her dull and friendly husband? But when all these adventures take place in Hollywood, Barchester is still very much with us. Something even more exciting is happening there as Lady Norton and her new friend, a famous professor of botany, are trying to create a horticultural miracle. Will the two plant fanatics be able to raise, under the rainy skies of England, the rare cactus Echinocactus horizonthalonius var. nicholii, a monstrosity that can only grow on alluvial fans composed of limestone-derived soils in the Waterman and Vekol Mountains, and can split rock with its bare roots? And will the villainess who is trying to steal their secrets succeed in her heinous plans, and grasp the horticultural glory? Have no fear. We keep to our traditions, and as always, nothing really unpleasant ever takes place in the County. Somehow or other, everyone ends up feeling happy with what fate hands them on a silver platter, next to a nice cup of tea and a perfect cucumber sandwich. 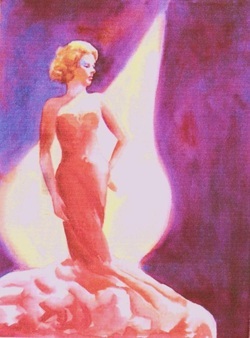 The original cover of the printed book. Currently the books are availabe only as e-books on the website of the Angela Thirkell Society (see above).